1.1 29/11/2017 Added 'Tooltip Helpers' section. 1.2 11/12/2017 Updated raindrops/refraction and additive-spec. sections. Character tech in FSW is fundamentally very similar to previous titles built with this engine, but with some improvements added to enhance workflow. We explore the character implementation process below. Previous titles built with this engine approached characters by treating them as part of the aircraft. FSW, however, uses an approach which treats characters as separate entities, enabling mission designers to decide which characters should be used, and where. In other words, characters are now loaded into and out of aircraft at run-time. In addition to this, exposed skin (i.e. heads, and hands), are treated seperately to clothing, allowing any combination of the two to form a character. Default characters can be specified within an aircraft's model.cfg file as illustrated in the image below. Pilot data use the suffix pilot_ followed by either Base, Body, or Head. Passenger data use the suffix passenger, followed by an incrementing index, and then either Base, Body or Head. The number of passengers present in the model.cfg file must be specified using the tag [passengers] followed by capacity=n on the next line, where n is an integer value. Base MDL containing animation data. In the case of a pilot these animation data will usually contain animation tags relating to control instruments. With passengers an animation tag producing a looping animation is normally used. Body MDL containing clothing models. Head MDL containing exposed skin models, such as a character's head and hands. Animations can either be generic across all aircraft and seats, or specific to a particular seat of a particular aircraft. The next step after this is to specify payloads in the aircraft.cfg file. The first parameter is a boolean toggle to enable the station. Following this is the default weight (in pounds) for the station. In the case of characters (as opposed to cargo), setting a value of 0 will disable the character. Following this parameter is the maximum user-configurable weight (in pounds) that can be applied to the station. The last parameter is the character index used in the model.cfg file. -1 is used to mark a non-character station (such as cargo). FSW characters require a 3DS Max Biped in order to animate correctly. This is to allow animations to be stored separately to characters. Animations using the biped system should contain a T-pose at frame 0. Any subsequent frames should be treated as usual. As FSW characters are independant of aircraft, the engine needs some way of knowing where to place a character. This is done using locator sockets (i.e. geometry with attach-points applied). The convention is to apply an Empty attach-point to an invisible box using an Attach name describing which character the box is tied to. The name should start with the prefix CharacterSocket_ followed by an index corresponding to those used in the model.cfg and aircraft.cfg files. The attach-point tool will add its own enumeration to the end of the name; this enumeration should not be changed. The tail number of an aircraft corresponds to its unique identifier. It can be painted on various parts of the aircraft. Because tail numbers can be dynamically assigned at run-time, they should not be baked directly into textures. Instead, artists should reference a dynamic texture which the engine creates at run-time (rendered via a render target). By convention, all dynamic texture names must start with $ and the name of the tail number texture is $registration. atc_id: This is the default registration of the player’s aircraft. Example: G-BRGI for a general aviation aircraft in the UK. atc_id_font: This is the font name used for rendering the tail number. The font name must correspond to an entry in Fonts/fonts.json file. Example: “Arial Big”. atc_id_color: This is the colour which will be used to render the tail number. This is a hexadecimal number using ARGB format. Example: 0xFF00FF00 for pure green. FSW features a brand new real-time raindrop solution. It calculates and renders falling raindrops, taking into account forces such as wind, acceleration, and gravity. Below, we explore how to setup an aircraft to use the new system. Raindrops are generated as 2D texels in a compute shader. They assume the U axis points along the world XZ-plane, and the V axis is aligned with the world Y (up) axis. Any other UV configuration will lead to odd raindrop behaviour, including inaccurate travel paths. Distances between UV points should be as proportionate as possible to prevent raindrops changing size during their lifetime. This makes a cylindrical unwrap the most appropriate UV unwrap solution. Some cleanup work will be necessary to ensure the cylindrical unwrap is proportionate on the V axis. It's essential the V axis is aligned to the world Y (up) axis as stated previously. Otherwise, the compute shader won't have a correct concept of up-and-down, meaning raindrops will move along the wrong axes in-engine. Further, UV projection should be cast from the perspective of a pilot looking out through the windows. If using a cylindrical unwrap, for example, the projection cylinder should not envelope the window geometry and cast inward; rather, it should reside within the window geometry and cast outward. If using a program other than xNormal, it is essential to ensure swizzling, axis polarity and/or handedness matches xNormal's default output. If results in-engine are inconsistent with expectations, looking at individual colour channels of the OSN will help diagnose the problem. Each colour channel represents a pixel's normal direction in World-Space along a particular axis. The image below, for example, depicts an OSN map's Red channel (i.e. it's X-axis). The white pixels on the right represent normals pointing positively along the X-axis, and inversely, the black pixels on the left represent normals pointing negatively along the X-axis. The grey pixels in the centre have little-to-no magnitude along the X-axis as they represent the front of the windshield where normals point positively along the Z-axis. The object-space normal map should be stored in the aircraft texture folder with the suffix _glass_OSN.dds The texture should then be plugged into the PBR material's texGlassOSNMap slot, and in the Refraction section, Enable Refraction should be checked. One final step is to ensure raindrops die at window edges by adding an Exclusion map to the alpha channel of the OSN map. 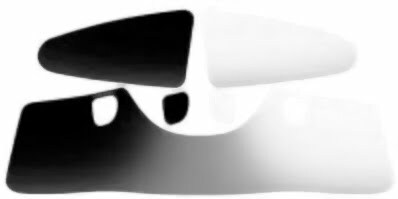 White permits the existence of a raindrop, and black kills a raindrop upon touching it. This same Refraction functionality can additionally be used to simulate general-purpose refraction for other effects, such as shattered glass. For this, the PBR material should be configured in the same way as glass for windscreen raindrops. FSW will use the the material's normal map to determine the screen lookup position. Raindrops are supported on refractive materials as per normal. FSW features point-lights with quadratic falloff. They are markedly more realistic than point-lights in previous titles built with this engine. Currently, only four point-lights can be placed within a single aircraft, although this limit will eventually be removed. It is recommended they are used to simulate cockpit floodlights and dome-lights. In previous titles built with this engine, an ambient colour is added across the board to ensure no region is 'too dark.' This doesn't make sense in a modern HDR lighting pipeline where brightness ratios should be truly representative of real-life counterparts. However, without adaptive luminescence (a feature planned for the future), having extremely dark areas can be destructive to the simulation experience; this is particularly evident on the gauge fascias cast under shadow. To mitigate this, ambient point lights can be used to simulate ambient lighting. This is preferential to the previous approach, as it only applies to the local area of the point light, meaning lighting elsewhere in the aircraft is undisturbed. Applying ambient points light is entirely option and should be avoided where unnecessary due to the performance cost. Ambient point lights are added to the aircraft in the 'aircraft.cfg' file within the [LIGHTS] section. They should be assigned to lighting circuit 11, which has been newly added to FSW for this express purpose. Traditionally a material which has a very low alpha value would be invisible, and would reflect no specular light. However, many real-world transparent materials do not behave in this way, instead reflecting large amounts of specular light. For example, sunlight reflecting on glass. To simulate this effect, FSW can allow translucent PBR materials to reflect all specular light, as though they were regular opaque materials. This can be enabled via the Additive Specularity property in 3DS Max. Note that alpha values must slightly exceed 0 for this effect to be visible; a value of 0 will reflect no specular light. This behaviour allows for features such as holes cut into glass, where an alpha value of 0 would represent the absence of the glass. Previous titles built with this engine approached external lighting by using sprites to give the impression of a bright light source shrouded in bloom. FSW uses a hybrid approach, utilising the previous system at a distance, and true HDR bloom at mid-to-short range. External lights should be modelled and made emissive through texture and material setup; they will then bloom via the HDR system. In order for a sprite to appear beyond a certain distance, two additional lines should be added to the relevant .fx file. These parameters specify where the sprite fade transition starts and ends. In previous titles built with this engine, an entire aircraft would be tested for mouse events. FSW has been optimised to only test explicitly designated geometry for mouse events. This greatly reduces the CPU overhead associated with mouse testing. Geometry with associated mouse events should have the flag, ‘Allow Poly Picking,’ in the section, ‘Virtual Cockpit Poly Picking,’ enabled. In previous titles built with this engine, it was common to tie a functionality tag (i.e. mouserect tag) to an actual piece of rendered geometry seen by the end-user. Because the poly-count of FSW content can be quite high, this no longer makes sense. We suggest using a low-poly proxy mesh as illustrated below. In testing, this approach has freed-up around 10 FPS during mouse event testing. Generally, a dedicated poly-pickable mesh will be parented to the corresponding rendered mesh. This helps with scene organisation, and ensures moving parts remain interactive. Helper tooltips can be applied to geometry using the mouserect option of the Attach Point Tool. The same methodology as with polypick objects applies to helper objects. Helpers are useful for providing readouts, explanations and information about a given object (such as a gauge) to the user when in the cockpit. See the Tooltip Helpers List page for a comprehensive list of currently available helpers. The image on the left demonstrates a helper object applied to the fascia of the gauge. Upon mouse-over, the player is presented with a tooltip describing the function of the gauge. FSW features a new system for simple translation of aircraft tooltips. Tooltips specified in the modeldef file can now be translated using the TooltipText tag. If a translation string ID is used within the TooltipText tag, this will get replaced with the appropriate string (based on language selection) when processed in engine. Note that a @ symbol is required at the start of the string ID. It's also possible to use gauge code within the string which will get evaluated when the tooltip is shown (e.g to show on/off depending on switch state). See the images below for an example. The translation string IDs can be from the core FSW translation set or additional translation set supplied with the aircraft.